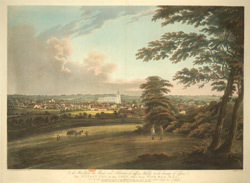 Since the middle ages, Saffron Walden was a busy and prosperous town in Essex, on account of its wool trade. Its name comes from the saffron plant used in wool dyes. The landmark of the town is the parish church of St Mary the Virgin. Its unusual length of 200ft and lofty, pinnacled roof and west tower make it one of the most impressive parish churches in Essex. It is reminiscent of King's College Chapel at Cambridge. Indeed they have similarities: being built from the mid 15th century and master masons Simon Clerk and John Wastell worked on both buildings.